Do your teeth have stains, discolorations, chips, cracks, gaps, or slightly misaligned teeth? Do you constantly feel self-conscious about people seeing your smile, including close friends and family? Would your life be so much better with a confident smile? If you answered “yes” to any of these questions, then porcelain veneers from Yenzer Family Dental may be exactly what you need. Porcelain veneers are extremely thin ceramic coverings that are bonded to the front of the teeth to dramatically change their appearance. With them, we can eliminate all of the flaws we listed above at the same time! You can get one to enhance a single tooth or a complete set to achieve a smile makeover—it’s entirely up to you. Each veneer is custom-made and colored to meet your exact specifications. If you’re ready to get the smile of your dreams, then your first step is come visit Dr. Jeff Yenzer. He’ll talk with you about what you would like to change about your smile, and he’ll let you know if porcelain veneers are the best way for you to achieve your goals. If they are, the entire process to get them usually takes about two to three visits to complete. At your initial visit, he’ll slightly reshape your teeth so the veneers will lay flat against them, take an impression, and this will be sent to a dental lab to help design and fabricate your veneers. You’ll wear a temporary set while this is being done. Once they are ready, you’ll return to our office where Dr. Yenzer will remove your temporaries and place your permanent veneers. 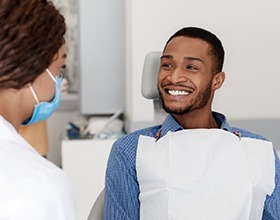 He’ll check the fit once more and make sure your bite is properly aligned, and after that, your new smile is ready for the world! If there’s something you don’t like about your smile, porcelain veneers can help you finally do something about it! To learn more about this fantastic treatment and what it could do for you, please contact us today.